The PokerStars WCOOP has survived grumbles about payouts and re-entries (or lack of) to end with a bang. The 2016 online showpiece finished this week with a Main Event worthy of the series. The latest World Championship of Online Poker ended with a $5000 Main Event, following 81 tournaments of varying buy-ins and talent pools. And it was Germany’s Jonas “llJaYJaYll” Lauck who capped off a great series with the Main Event trophy. Lauck won $1,517,541.25 for his troubles after a protracted and complicated ICM deal. And it looked at the final table as though Jonas Lauck wouldn’t be following in the footsteps of compatriot Fedor Holz, the 2014 WCOOP Main Event champion. “llJaYJayll” was on around 8.3 million chips going into the final nine, some way behind “Gambler4444” on 16.8 million and “uknowProsky” on 32.3 million chips. And the German was in trouble early on when he ran his A-K into “Olorionek”‘s A-Q. A queen on the river doubled the short-stack and crippled Lauck even more. He was left with just nine big blinds. Lauck was thrown a lifeline when he found aces against “Gambler4444″‘s queens. “Let’s start from the beginning,” the winner quipped as he regained his FT starting stack. After “deadfizh” and “gorodski” departed in 9th and 8th, things started to get exciting. Again, “llJaYJayll” picked up aces and shoved after a re-raise from “uknowprosky” with jacks. The board ran in the German’s favour and he found yet another timely double-up. “llJaYJayll” finished the player off with a flush a few hands later, and took the chip lead to boot. With five players left a deal was attempted but “R_Scientist” was the lone voice wanting to carry on playing. Even after “axpitos_86” bust in fifth, a deal wasn’t made. Even after a four-handed deal was close, “llJaYJayll” decided he had the momentum to keep going. And soon he was up to 50 million chips. “Gambler4444” fell in fourth to cap a great online series for him. 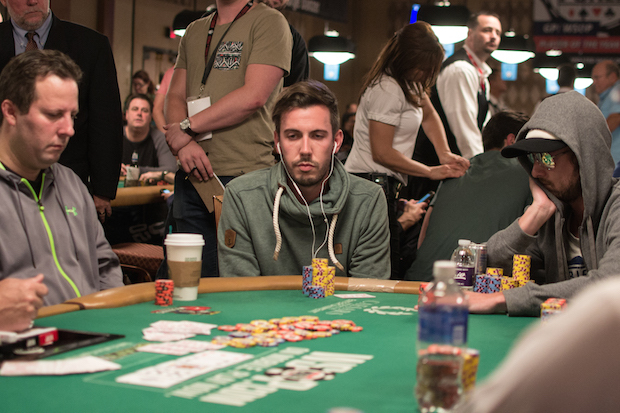 The player recorded three final tables in all over the 82 events. And “llJaYJayll” would dispatch “R_Scientist” soon after with K-J against 8-8. The decision not to make a deal turned out to be a good one for “llJaYJayll” as he headed into the heads-up phase with a 61 million-to-42 million chip advantage. After an hour’s play, the advantage had nearly been closed before a key pot emerged. After a raise, three and four-bet, and all-in, the chips were in the middle as “llJaYJayll” flipped over A-K. “0409479” was in slightly bad shape with A-Q, and the king on the flop was enough to leave “0409479” with just a single big blind. Predictably, the final bb was in the middle on the next hand, “llJaYJayll” sealing the deal with A-7 against 4-8. A $1,101,278.90 payout was still a huge consolation for the runner-up. For Lauck, the win added to what is already an impressive live haul. The German pro has over $1.3 million in live tournament cashes. Just this year he has racked up cashes on the EPT, LAPT and WSOP. 2,091 runners (including re-entries) had turned out online to battle for the $1,517,541.25 Main Event first prize this year. 224 players shared out the prize cash, with everyone at the final table guaranteed a six-figure payout. The runner total was 100 up on last year’s (1,995) but slightly down on the year before. In all, however, the 2016 WCOOP managed to pay out over $73.5 million across its 82 events. That marked a record for PokerStars and sets them up well for next year’s series.